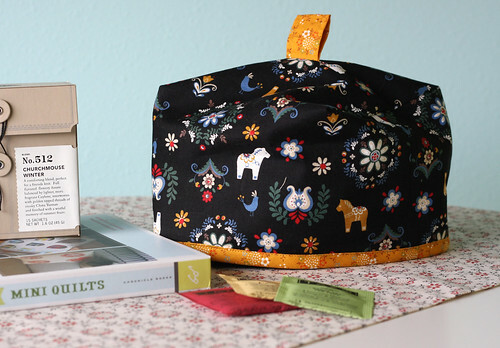 Cindy selected My Folklore Dala Horse Black & My Folklore Medallion Ochre. The Tea Cozy was an easy pattern to follow. It took less than an hour from start to finish. The completed project is more square than it appears in the photos. Instead of using ribbon Cindy made her own bias binding out of a contrasting fabric. 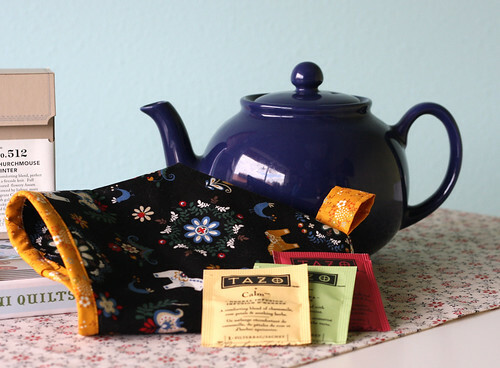 This charming Tea Cozy will brighten up your kitchen…it’s so cute! Carrie chose French General Maison De Garance Florence Natural & French General Maison De Garance Primevere Red. 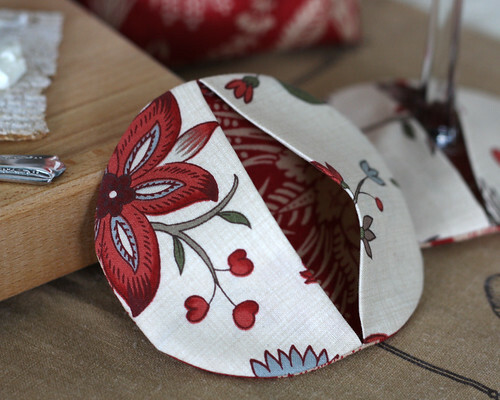 A small alteration was made to the pattern with the addition of squared corners on the bag base. (follow the directions on pg. 70 “customize the corners” cut a 1 1/4″ square) Do this for both the lining and exterior. A special way to present a bottle of wine. 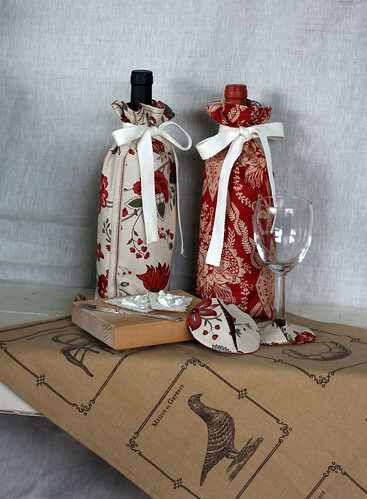 Plan on making a stack of wine bottle holders for birthday and hostess gifts. If using the French General fabric, include the selvage when measuring the exterior fabric. The actual selvage is in the seam allowance which allows the pretty edge design to become part of the bag. The Coaster design is really fun. Easy to follow directions make for a great addition to this gift set. The Pink Chalk Team suggests making them in different colors so your guests can easily identify their glass. 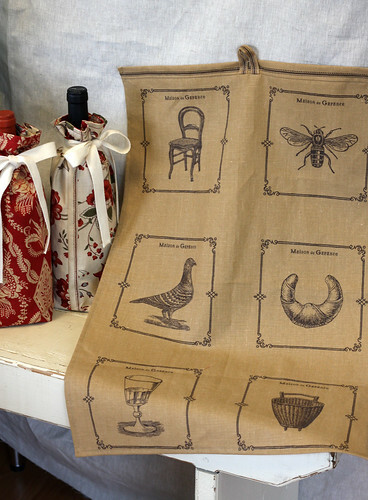 Inspired by the French General and wine theme Carrie created a towel from French General Maison De Garance Linen panel Tea.